The Arizona Oral Cancer Walk (AzOCW) was started by Dr. Terrence Yu and a group of dental students in 2008. The first event was held in fall of 2009. With the support of the Arizona Dental Association, the Arizona Academy of General Dentistry, and local dental and dental hygiene schools, the first walk event was held on Saturday, October 25, 2009. It was able to raise over $7000 and increase awareness about oral, head and neck cancer to the community. There were 81 walkers who attended. Dr. Yu’s vision was to mobilize volunteers and implement a community health initiative that would unite the community, both the dental and the greater public. This union would not only increase the amount of individuals receiving oral cancer screenings, but it would increase education/awareness for this silent killer, promote early detection and diagnosis as well as raise funds for the national initiatives and research. 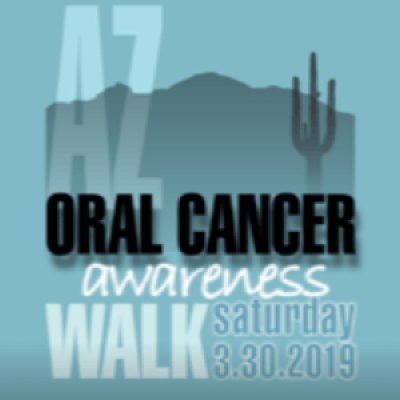 Serve the dental professional community of Arizona by increasing education about the risks for and prevention of oral, head, and neck cancer, as well as the importance of routine oral cancer screenings and biopsy indications. Serve the greater public community of Arizona by raising awareness about the importance of early screening, detection, and treatment. Serve individuals who have been diagnosed with oral, head or neck cancer as they navigate through life before, during and after cancer treatment.